I’ve been teaching continuing education childcare classes on Saturdays. I teach one 2 1/2 hour session, we have a break and then another 2 1/2 hour session. In between the two sessions participants take about a half hour break giving them time to eat lunch. One of the gals in my class is a part of Weight Watchers. She’s been working hard at it and have lost 65 pounds. She always brings healthy snacks with. The other day, she brought an apple with a rubber band around it. I looked at it curiously not knowing why there was a rubber band on it. Then she popped off the rubber band to reveal a cored and sliced apple. I was so happy to see this. I love eating slices vs a whole apple. I love having the cored too. The apple doesn’t get brown right away and there is no need for to soak the apple in lemon juice to keep it from browning. This is probably one of those things that everyone except me knows about but being I rarely pack a lunch for myself, I didn’t know it. I’ve been trying to be a little better with my diet so I think I am going to prepare an apple in the morning and have it ready for a snack later in the day. Does anyone have any other healthy snack ideas for me? I could really use some healthy eating tips. This entry was posted in recipes on February 20, 2014 by Jo. My favorite healthy sack is a snack-sized Baggie of grape tomatoes. Easy and portable. My favorite snack requires a little prep but once it’s done, it’s super easy. I get raw almonds at store and toast them spread out on a cookie sheet in the oven for 10 minutes at 350. When cooled I mix them with about 1/2 as much dried tart cherries. I keep on counter in jar so each morn when making my lunch I can grab a handful in a plastic container for an afternoon snack. I try to keep clean, cut vegetables ready to eat in the refrigerator. At least when they are at the ready I don’t have an excuse for grabbing something not so good for me when I’m famished. 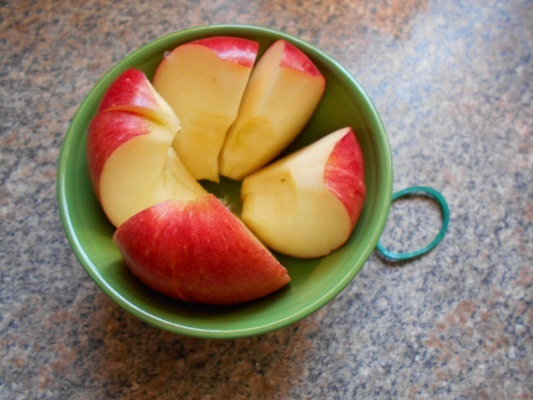 I didn’t know either, about coring and slicing an apple, then keeping it in an elastic. I will do this, though, since my eating brown(ish) slices appalls many people! You could keep any kind of nuts in a bag in your purse or backpack or whatever. It only takes a handful to keep the hungries at bay, and you probably won’t eat the whole bag in one sitting! When my kids were small, we would take an orange and score the outer rind into quarters, then when they were ready to eat it would peel very easily with no mess. I frequently take an orange to work or a baggie of grapes to keep the munchies at bay. 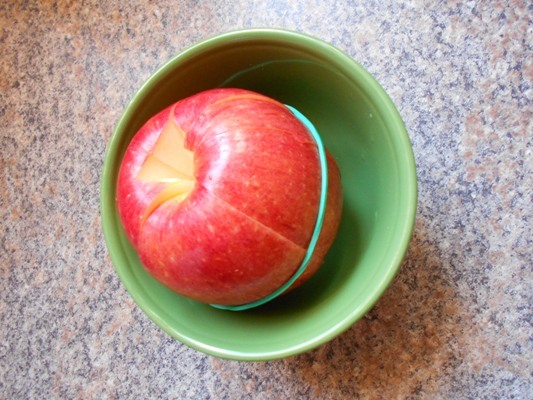 I always slice my apple before eating but never heard about putting a rubber band around it to keep it together. I’m going to try that when we are traveling as I don’t usually eat apples because I don’t want it all brown. Great idea! I’m surprised it didn’t brown in the centre/core area… I go for roasted almonds- easy and portable – or grapes. Besides apples, which I love, grapes and 94% fat-free popcorn minibags are my go-to snacks. I am also doing Weight Watchers, and it works! Whoa!! Jo, you just blew my mind this morning and changed my life! I carry an apple slicer around all autumn but now I know a trick. Thanks much!